Bernese mountain dog breed gets its name from the place it lives in Bern Canton; the central region of Switzerland that is considered the second largest region of the 26 Swiss Cantons according the surface area and population. This breed began to appear when the Romans brought mastiff-like dogs to Switzerland 2000 years ago, but some people contest that theory as the remains of these dogs were found in Switzerland, before the Romans crossed the alps. Unfortunately, there isn’t much information to talk about. Artists like to put the pictures of this dog on the canvas. Bernese mountain dog is considered a Swiss mountain dog that belonged to the Swiss Alps, being known for their strong nature, being a calm breed, having a tri – color coat. 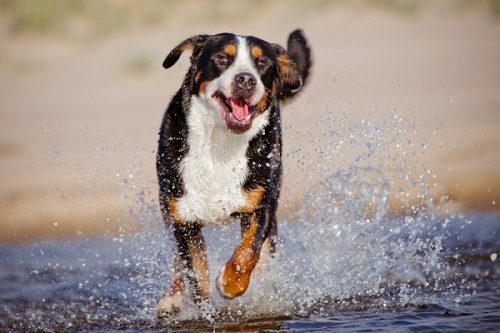 Although There are other dog breeds that are similar to Bernese mountain dog as the Appenzeller, Entlebucher mountain dog and the Great Swiss mountain dog, the Bernese mountain dog is distinguished with its long flowing fur. When the cheese plants began to appear, the producers need large dogs to pull carts filled with their products. 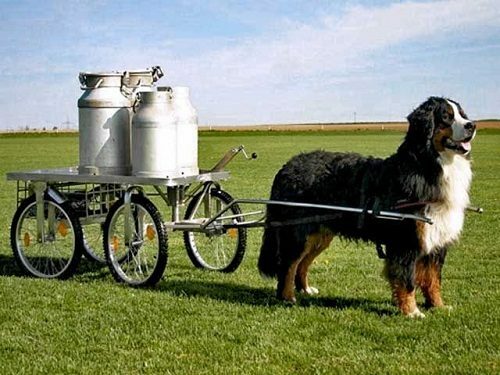 Berners can pull these carts on their own, while other breeds need children to help them. There are many countries that used these dogs for pulling carts like Belgium, France, The Netherlands, Canada and the Alps mountains. The Bernese mountain dog has a strong leg to endure the rocky nature of the mountains, used as herding and guard dogs for farm families. They are considered good companions to humans as they are calm, and friendly with the humans. Berner is considered a strong muscled breed that can carry up to 1000 pounds. This means that it can carry 10 times of their own weight. 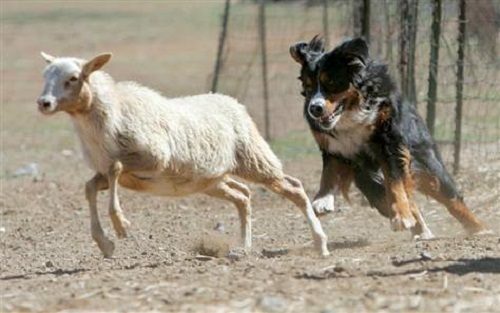 These dogs were used for herding, hunting and have a great ability of endurance. 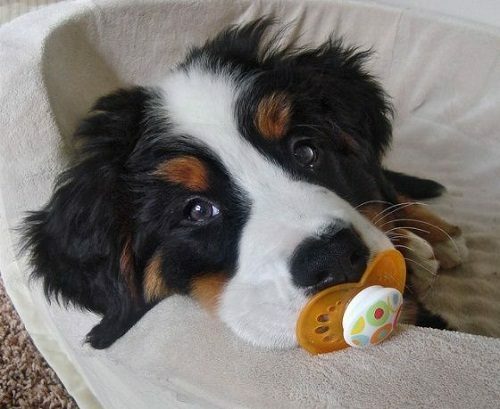 Berners has a sense of humor that appears in responding to laughter, and they can make their owners laugh by repeating the action that leads to the laughter. Some breeds of dogs have a sense of humor that makes such dogs a great pleasure to their owners. They are considered lovely companions that make silly things to make us laugh. Charles Darwin was the first scientist who suggests that dogs have a sense of humor. 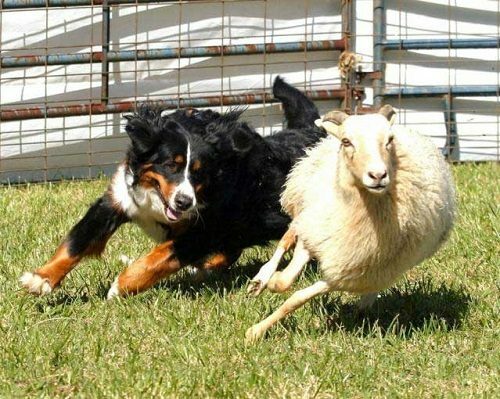 When the people in Switzerland began to love the St. Bernard dog breed, they forget the Swiss mountain dog, but The Swiss Kennel Club didn’t recognize any of the two mountain dogs. 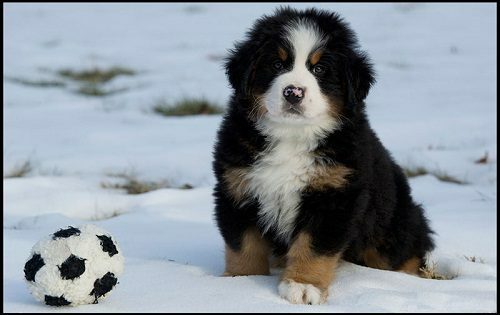 Despite of that, farmers in far areas used the Bernese mountain dog and others of its kind. The breed became less popular until Franz Schertenleib popularized the breed by promoting it across Switzerland and Europe. 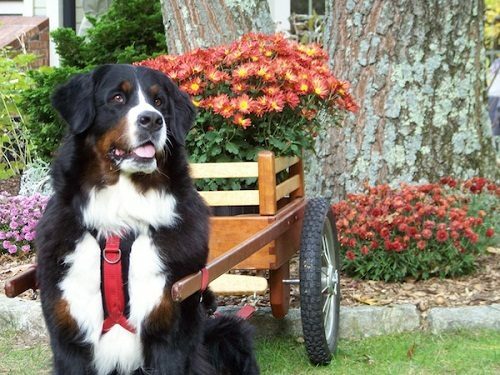 Berners were bred to pull carts and became happy when they do it, in spite of not needing to cart- pulling canines. The Bernese Mountain dog holds the club of America for the carting Competition. In 2009, a new cart were made to meet the needs of the customers that are designed to be suitable for traveling. 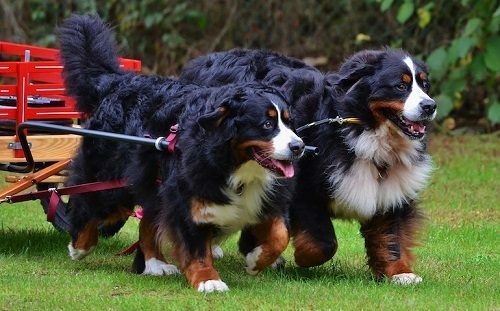 Bernese mountain dogs mature slower than the other dogs, so they need patient training. 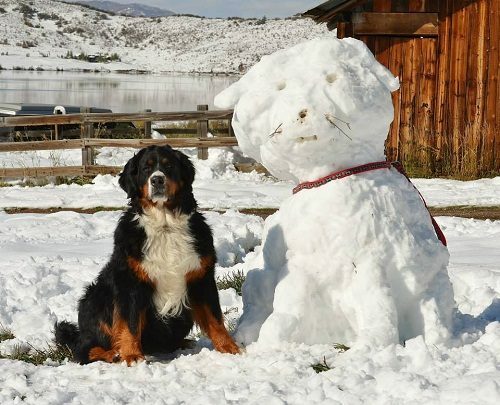 Sometimes many people found it difficult to know whether or not a Berner mountain dog is fully grown. There should be a difference between the time that puppies reach their full adult size, and the time it takes to mature. Although it takes long time to finish growing, most puppies reach their full size when they are 12 to 18 months old. This breed has slower in growing and its adult reached its full weight when they are two years. 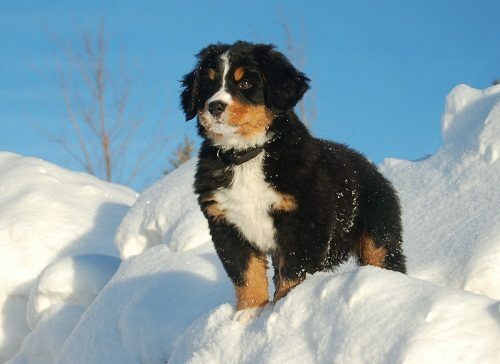 The Berner mountain dog is distinguished with its coat that catches your eye from the first sight, being a strong dog that is suitable for heavy work as it has a muscular neck, deep chest for heart and lung capacity. It is considered a lovely dog breed, being gentle with its owners. It can pull a cart, compete in tracking, do searches, and rescue work, so it loves work, and without taking care of its working character, it will become destructive. Therefore, it needs daily walks and competition training. Berners needs regular baths and require regular brushing for their thick coat that made it suffer in hot climate, so summer exercise should be limited. Breeders should use the database to build profiles of the dogs they intend to own and they should avoid dogs from families with a history of genetic diseases. Special attention should be paid to the ears of the Bernese mountain dog, as they can trap bacteria, dirt and liquid. The risk of an ear infection drops with weekly ear cleanings using a veterinarian advice.